Burkina Faso's transitional president Michel Kafando attends the official handover ceremony returning him to office in Ouagadougou, Burkina Faso, Sept. 23, 2015. Burkina Faso's transitional civilian president, Michel Kafando, says he is back in charge after being detained and ousted by soldiers one week ago, but sources of tension remain. West African leaders were in Burkina Faso Wednesday to negotiate with military and civilian authorities as protesters condemned any attempt to give amnesty to coup leaders. About 2,000 people gathered on the roadside Wednesday as regional heads of state came to shepherd the country’s return to constitutional order. Brandishing signs which read, "No amnesty," and "RSP: murderers," with RSP referring to the presidential guard, the protesters’ message was clear. "One of them said if we give amnesty to coup leader General [Gilbert] Diendéré, that means that tomorrow, I can get up and kill my neighbor and then ask for an amnesty. This is inadmissible. In Burkina we don't want that," said Kare Aminata. A deal proposed by the Economic Community of West African States (ECOWAS) on Sunday called for the coup leaders (or putschists) to return power to the transitional civilian authorities in exchange for inclusive elections and an amnesty. Diendéré has stepped aside, but the question of amnesty remains unsettled, as does the fate of the presidential guard. Prior to the coup, a government commission recommended the RSP be dissolved. The RSP has agreed to remain confined to its barracks, while the army moves back 50 kilometers from Ouagadougou. 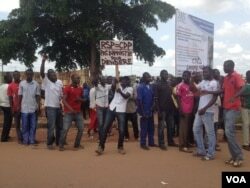 Army troops had entered Ouagadougou on Tuesday and pressured the RSP to surrender. Burkina Faso was already working to emerge from one crisis when members of the RSP stormed a Cabinet meeting last week and took transitional authorities hostage. Since the onset of the crisis, at least 10 people have been killed and more than 100 injured. Elections were slated for October 11, one year after street protests ousted longtime leader Blaise Compaore. They have been delayed. Interim president Kafando says he will continue doing what he was doing, which is getting the electoral process back on track. ECOWAS has called for the polls to be inclusive. It is not clear whether the national government will reverse a measure voted on earlier this year that barred members of the ex-ruling party from running. Coup leaders cited that exclusion as a reason for the takeover.